171 pages, 6 ¼ x 9 ½"
After becoming aware of seemingly unrelated events in the lives of young people that could not be subsumed under standard children's issues, the authors began a study that culminated in this text. These events ranged from reports about children with multiple parents and open access to adult information and experiences to an increasing vulnerability of children to diseases previously associated only with adults. The increase in frequency and range of these events led the authors to question the effects of these events in children's lives: what are the new needs that children have that grow out of these experiences? 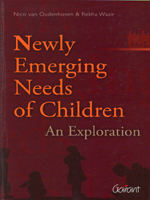 NENs - Newly Emerging Needs - is the language the author's use to address this loosely connected group of new challenges, problems and opportunities confronting children. They provide a working definition of NENs, explain how and where they can be identified and what is 'new' about them, and continue on to test these ideas in India, Kenya, the Netherlands, and Nicaragua. Seven themes are then further explored: the changing concept of childhood; implementing the UN Convention on the Rights of the Child; the uneven rise of 'girl power'; bypassing of traditional mediators; the fusion of reality, virtuality and the impossible; accessing new terrains and exposure to global lifestyles. A set of policy recommendations for identifying, monitoring, and responding to new trends is then offered. Chapter 2. What, Then, Are Newly Emerging Needs?